Gentle body scrub with a relaxing massage in a side position. Gentle massage in a side position. Relaxing treatment with soft textures and gentle massage techniques. Dry and sensitive skin types are given special attend and you will find deep relaxation. Vitalizing footbath with herbs. Warm, gentle wraps treat your back and your feet. A soft and relaxing massage for new energy. Warm, vaporised herb stamp relaxes the muscles and stimulates blood flow. Allow the power of hot lava stones to work their magic on you during a relaxing spa massage. The warm stones as a source of energy help release tension: the tissue relaxes, and lymph flow and blood circulation are stimulated. The ultimate feel-good experience for the body and soul. Relaxation for the skin and senses. Warm oil from the cocoa bean enriched with shea nut butter lends this full-body massage its special appeal. A Massage after the education of the 4 Elements fire, water, earth and air. A prevention against stress and a timeout from the daily life which gives you back your energy. Relaxing phytotherapy and aromatherapy complemented with Balinese massage techniques. Enjoy a gentle massage with warm body oils and exotic aromas. A full body scrub with sea salt followed by a spa massage with exquisite aromatic oils. Exotic body scrub with macadamia nut oil. Followed by a gentle, relaxing massage for the face and neck. An absolute feel-good experience for the body and soul. A full-body treatment using marine ingredients. Starting with a seaweed pack on the soft pack couch followed by a full-body scrub with sea salt. Enjoy a relaxing oil massage ... like a short break beside the sea. The healing power of seaweed naturally invigorates and detoxes the skin and lends new tone and vitality. Aroma creme pack with essential oils – aromatic indulgence. Pure relaxation on pleasantly warm hay cushions made from organic alpine hay. 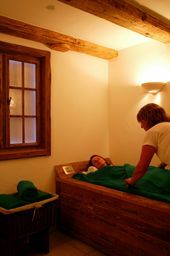 The alpine hay stimulates the body's metabolism while having a harmonising and balancing effect on the mental level (without body scrub). An ancient natural remedy. Soothing and relaxing for muscles and joints with a special deep effect, stimulating the metabolism and circulation (without body scrub). Pure and heated sea mud from the ground of the dead see acts relaxing, remineralizing, skin tightening and can be used with allergies and skin irritations. The exquisite active ingredients in evening primrose provide moisture and have a lipid-replenishing effect. Particularly suitable for sensitive skin and people with irritated skin. Body pack according to a special recipe comprising milk and exquisite oils. The beauty secret of silky soft skin.